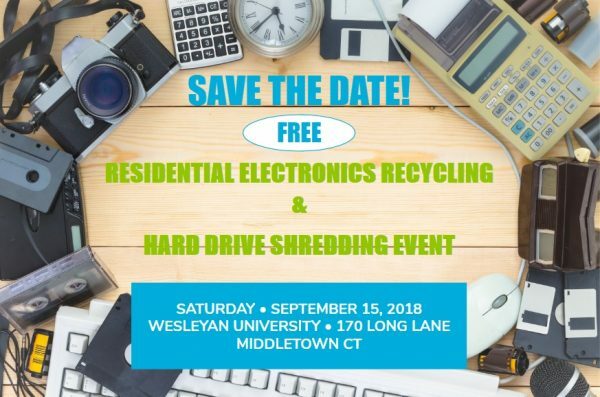 On Saturday, September 15th, Wesleyan will be hosting a FREE residential e-waste recycling and hard drive shredding event from 9:00 a.m. to 1:00 p.m. This event is open to all Connecticut residents at no charge. Residents are not required to pre-register. Take 2’s mobile hard drive shredder will be on site to shred hard drives, which should be removed from computers and laptops and ready to be shredded. Take 2 will not be able to remove hard drives from devices at the event. Take 2 will be on site to unload vehicles and safely package and transport all unwanted electronics to their Waterbury facility to be responsibly and securely recycled.